Hydro Nautics is being developed as a system for the marine and shipping community. To develop a sense of ownership we are open to all types of association. We are committed to working with our business partners to achieve high standards and to provide greater transparency on how we work together. Our idea of competition is to grow together and form close working relationships – many of them long-term. We believe in maintaining high standards together We believe no individual or entity is small to do business. With and we offer association to all our members globally. We hereby invite proposals for meaningful association. Finally true success of www.hydro-nautics.com will be when it will be identified by presence of its member and will be owned and run by its members. registration is free for life. Upon registration, members will be able to enjoy full benefits of marine forum and marine message board. However we request our members to pay a onetime fee of 100 USD as a set up charge for premium service of virtual office and web page. Why we have chosen to accept payments through Paypal account? Does it take time to understand the website tools? We agree that it will take some time to understand the full potential of our web. It is user friendly and we will ensure that you will always have something new to learn on the web every time you log in. Meanwhile our FAQ and help functions are a good way to learn more about the site. How is HyAcademy different from the other means of learning? HyAcademy will concentrate on the specific areas of training. We will make it absolutely flexible so that learning will be fun. For examples our exams will be on line and can be taken by a group together. Finally we will stress on the professional knowledge. For example – A professional with technical back ground may take a quick course to refresh his financial knowledge and vice versa. We also encourage creative work and professional mentoring programmes. How does www.hydro-nautics.com help in reducing environmental pollution and solving communication infrastructure issues? Our web based tools will ensure that you travel the least thereby saving a lot of our renewable resources. You may even find our office network so exciting that you need not set up a physical office. This is helpful for entrepreneurs who may like to invest their finances and time to their core business. What is a green survey? Green survey is an audit being developed by hydro-nautics for help our members run their enterprise and careers in an environmentally friendly manner. We do not set standards but use each other’s knowledge in building our green survey data base. Look out for more on this feature. Why is it better to join early? Joining early ensures that you compete with lesser number of your compatriots. Anyway it’s free of any annual subscription; it makes sense to join early and reap the benefits’. How to get My Flickr ID? 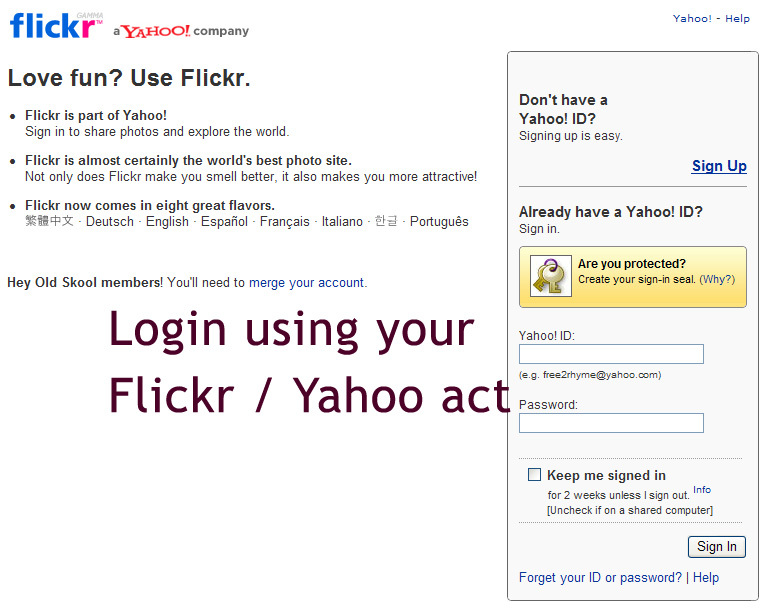 Go to www.flickr.com and login using your yahoo or flickr loginID and password . 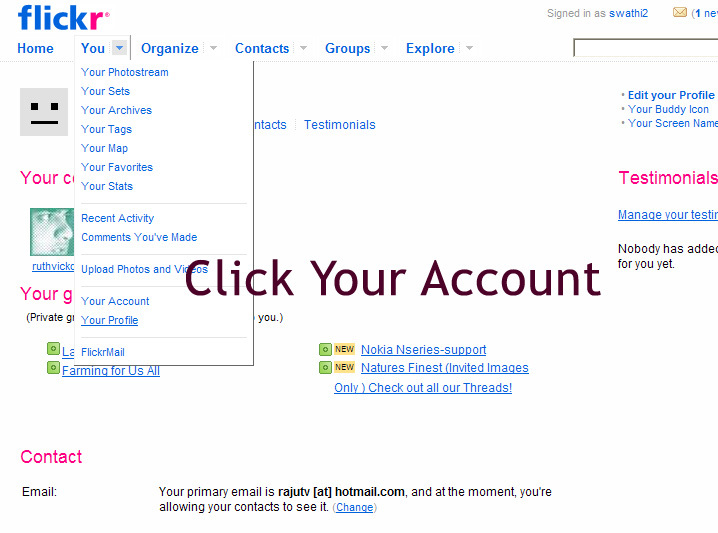 After login, click on "You" from top navigation, Under navigation "You" click on "Your Account". Once you click that link, the page redirected to your account page. Copy your account no from the url. See the below screenshots for reference.